Are you one of those Terminator fans who haven´t gotten your hands on any cool collectables fro m the franchise yet? Well now when the new Terminator movie, Salvation, is coming out you can bet your behind there will be re-releases of the previous 3 movies in the franchise. And to get you satisfied, Lionsgate Home Entertainment are gonna sell this beauty as the “Terminator 2: Judgment Day – Skynet Edition”. As usual the prices varies on different sites but its gonna be retailed at about 60-70 euros. Check out Amazon.de or Play.com for mor info. 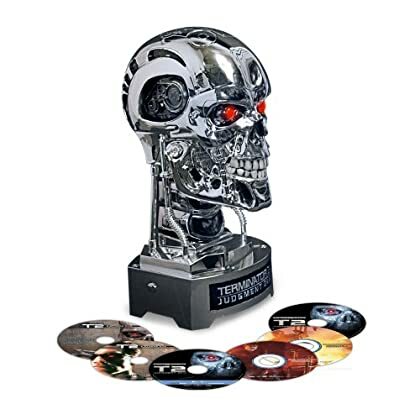 Some reports have been made that the endoskeleton might look cheap and plastic, but if you don´t already have 3-4 versions of the T2 movie( I do) and you want to have the most out of the movie, this is a pretty good deal if you ask me. 2 BDs and 4 DVDs packed with all three versions of the movie and tons of extra material, some in HD. I´m still not sure whether I´m gonna buy it or not since I don´t wanna trippledip all versions I already have of this movie, but only time will tell if I will buy it, probably I will.